- Around 95% of the rest of the population in Fancy Residences. - Taxation is the only source of income; no exports or gold mines. - Close to no empty space within the city. - Completed in 85 years. 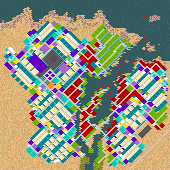 I put focus on city design and aesthetics, rather than on efficiency or stability. When the city is let to run for a while, you will notice that sometimes a Palatial Estate may devolve or a random building may catch fire/collapse. This, I assume, is a consequence of not using roadblocks (random walker behavior). Also, a big problem will be the census, since the population will steadily grow older. To complete the mission, send a gift to increase the Kingdom rating above 90. Very nice. Pleasing to the eyes.